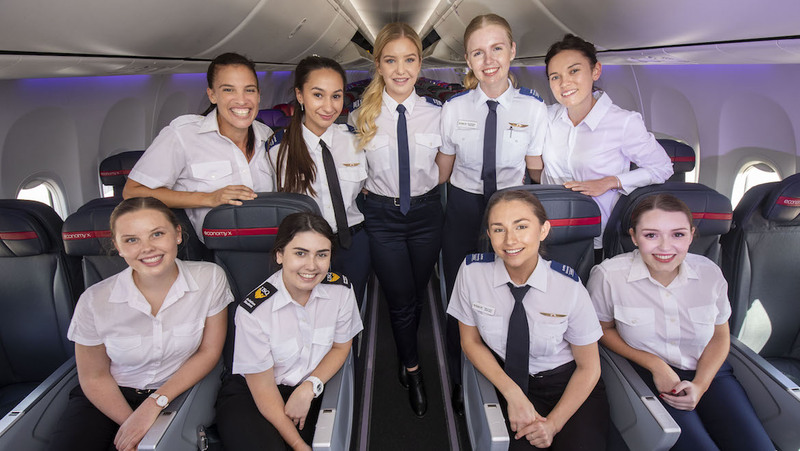 Virgin Australia says more than half of those selected for the latest intake of its pilot cadetship program are female for the first time. The airline said on Friday 56 per cent of recruits that passed the rigorous 13-week recruitment process that involved skills-based and academic testing were women. This was above the 50 per cent target the company had set and a 200 per cent increase on the previous intake. Virgin Australia director of group flight operations Stuart Aggs said he was “incredibly impressed with the strength of the applicants for this year’s program”. “We received more applications than ever before which has allowed us to select the best individuals for our next cadetship,” Aggs said in a statement. “At the end of the day, the selection process is merit based, and the application and assessment process sets a necessarily very high standard. The recruits will undertake their pilot cadetship at Flight Training Adelaide in South Australia in a 54-week course. The airline had said previously there would two ab initio courses, which is designed for those without any previous flying experience, starting in January and July 2019. Those who successfully completed the course would graduate with a commercial pilot licence and offered roles as first and second officers with the airline, typically on the Boeing 777-300ER or ATR 72-600 turboprop fleet. Virgin Australia group executive for people Lucinda Gemmell said the airline was committed to increasing “gender diversity across all areas of our business and in particular the non-traditional roles of aviation”. “Both the young men and women who have been accepted into the next program are all extremely passionate, talented individuals and we are very much looking forward to welcoming them all into the Virgin Australia family,” Gemmell said. Globally, estimates put the number of female pilots at about three per cent. The push to broaden the potential pool of aviators for the next generation is reflected in the Boeing 2018-2037 Pilot and Technician Outlook, published in July 2018, which showed a need for 790,000 new pilots, 754,000 airline maintenance technicians and 890,000 new cabin crew members around the world over the next two decades. Meanwhile, an industry report published in July concluded urgent action was needed if Australia’s aviation industry was to avoid disruptions due to the shortage of pilots and skilled maintenance engineers. While this latest batch of recruits will be based at Flight Training Adelaide, future Virgin Australia cadets will likely conduct their training at the airline’s recently announced pilot training centre in Tamworth. It was announced recently Virgin Australia had been selected by the Tamworth Regional Council to establish the flight school. The August 2018 edition of Australian Aviation magazine included a profile of Virgin Australia cadet pilot James Skordas. That story can be read here. Gender diversity via quota systems when you are looking after the lives of 300+ people is irresponsible. Virgin, and any airline should take the best, level headed, quick thinking, problem solving candidates with the greatest apptitude for the role. If that turns out to be 100% women or 100% men is irrelevant. But setting a mandatory quota and pressuring assessors to hire based on this quota could lead to dangerous outcomes in the future. This really annoys me, that companies are just hiring people based on gender to meet “targets” so they can brag about it when it should be who’s BEST for the job. I don’t think Virgin Australia have compromised their selection process. They are just reporting they achieved a 56% intake of talented women against their desired but NOT mandated target of 50%. Equal opportunity must be the foundation of selection in ALL employment. Mark, I think that’s the point. How can there be equal opportunity for all applicants to pass, if the company intends to achieve a gender based outcome? It will be very interesting to see the outcome when these very young ladies decide they want a family and continually miss their children’s milestones. I have nothing against women in the flightdeck it’s just sooner or later you’re priorities change. Have you given any consideration to the other 44% of the cadets? Is it any better for men to miss their children’s milestones? Being able to strike a good work-life balance is important for all employees. Please be mindful of your commentary on this topic. 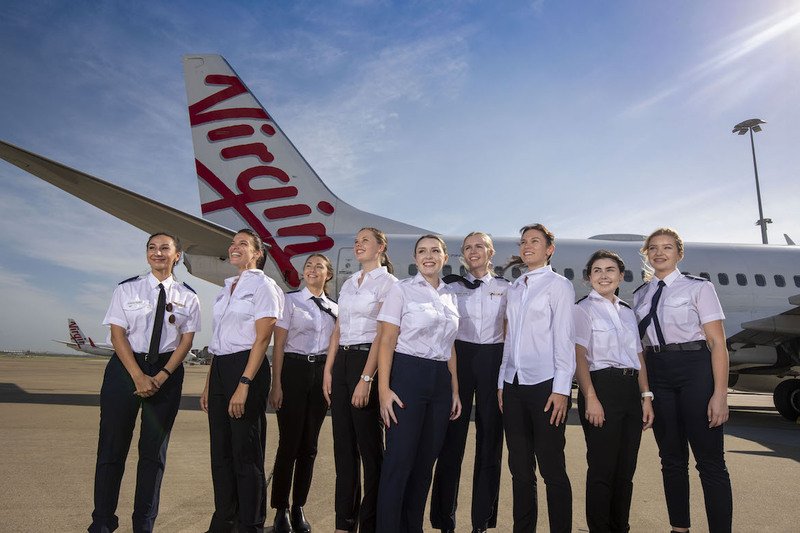 Virgin Australia has set a target of having half its pilot cadet intake female. This is not a quota as some of your comments have asserted. And as Stuart Aggs says in the article, the selection of cadets was merit based and the best individuals picked. I completely disagree with the comment above, airlines have very quickly realised that for years there has been an untapped source of pilots. Their view is not to make gender equality a reality, their focus is to have a continuous supply of pilots in order to continue to erode pay and conditions. If this trajectory continues the Uber driver that drops you off at the airport will be paid more than the pilots that fly you across the continent. @Frequent Traveller – Everyone’s priorities change whether you are male or female and we have both maternity and paternity leave available these days, I think it’s old-fashioned to be putting this comment up and dare I say it – sexist. Nothing sexist about my post, but just a point about sexism -maternity leave for females is approximately 14 weeks, while paternity leave for males is 2 weeks. As I said I have nothing against women in the flightdeck. All I’m saying is a mother’s bond with her child is amazing to watch as it developes. Whether you like it or not men and women and the relationship with their child is different. I adore my children as does my wife. She’s very thankful she doesn’t have to be away from them as much as I am. She also hasn’t had to miss Christmas’s and Birthdays as I have had to do. I hope you enjoy your career. 1) What are the true motivations of the airlines (and a plethora of other employers, both Government and Private sector) selectively ‘normalising for gender’ in their hiring practices (i.e. aiming for specific percentages [usually 50%] of new hires to be women, and in time, specific percentages [again, usually 50%] of the overall ‘steady state’ workforce to be women)? 2) Employers tout this normalisation for gender is being conducted to address past and present gender ‘imbalances’ in select occupations (i.e. airline pilots in this case). Why are they not implementing their hiring policies and procedures consistently across all occupations that have been traditionally male-domainted (i.e. engineers, maintainers, ground crew, corporate professionals, middle management and executives in the case of the airlines)? Is it a case of taking the moral high-ground when it’s commercially, politically and socially advantageous to do so? It would be interesting if Virgin released the number of females and males who applied for the Cadetships (I believe it was around 3500 in total). I would be surprised if it was a 50/50 split hense skewing the final result further.